Shopping is an interactive sport. While smartphone wielding consumers are the main players of the sport, retailers are the ones who set the field of engagement, both online and in the physical world. A variety of methods, tools and technologies exist for retailers to engage consumers, but few are as mature and easy to utilize as 2D codes. 2D codes are two dimensional (hence the name “2D”) images encoded with information. The information can be decoded with a camera-driven scanning application, which will perform a variety of functions including displaying texts, linking to a specific URL, or linking to video content. 2D codes are used for a variety of industrial uses, but 3 key types are used for consumer-facing uses: Quick Response Codes (QR Codes), Microsoft Tags (MS Tags, aka High Capacity Color Barcode) and barcodes. There are different reasons why retailers would use one type over another. QR Codes and MS Tags in particular have risen in adoption among consumers, especially those that use smartphones. Smartphones provide consumers with the hardware (including the camera) and a platform for the software applications (i.e. ScanLife, ShopSavvy, MS Tag, others), making 2D codes easily accessible and practical for shopping like never before. Forrester estimates that adoption of 2D code reading applications have risen to 15% in 2011 among smartphone shoppers and is expected to continue to rise in the future. Indeed, it’s difficult today to walk down the street or into a store or open a newspaper or magazine without finding a 2D begging to be scanned. 1. Create brand awareness with consumers. 2D codes are a great tool for marketers to capture the attention of shoppers—particularly those on the go with mobile devices and those inundated with other information sources– to create market awareness and craft brand perception. Barney’s New York used QR codes as part of a “Back Stage Campaign” in early 2011 where they displayed ads in the New York Times and online that contained QR codes which linked to online, content-rich “backstage” stories of the products. This energized the approach to traditional advertising and helped drive brand awareness among consumers who may have otherwise not been reached. 2. Share information to educate consumers. 2D codes can guide potential consumers towards purchase by providing them information about products, services, events, and more. Columbia Sportswear produces world-class outdoor apparel for consumers who are interested in learning about how the product was produced, what materials were used to produce it, what conditions the products are meant to be used in and what additional features the product contains that may not be readily apparent. They use QR codes as part of in-store signage and hangtags on products in its company stores, as well as other retailers who distribute Columbia gear, to provide consumers with more information about products through video and other content while standing in the store aisle. Electronic Arts, a leading producer of video games, provides its distributors with in-store digital signage that contain QR codes for content samples of their products. For their game Dragon Age II, shoppers could scan the QR code and get a video demo of the game. 3. Drive consumers to purchase. 2D codes give retailers a unique opportunity to convert sales, especially when they help solve specific problems consumers face, such as cutting down on checkout time or offering immediate rewards. 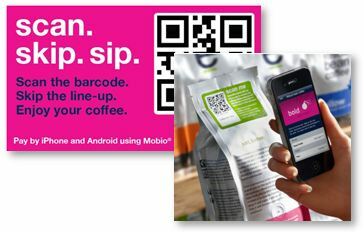 In addition to using QR codes to share information about how their coffee beans were produced, Ethical Beans Roastery and Ethical Bean Xpress Café give consumers the ability to scan QR codes on their products, allowing shoppers to skip waiting in lines and pick up the orders at checkout. Axis Salon, a trendy hair salon in Washington DC, uses QR codes in its storefront that link to videos featuring beauty icons and coupons for discount services—all helping to drive consumers to purchase. 4. Foster customer loyalty post-purchase. After the sale, 2D codes can drive foster customer satisfaction by providing extra services, support and personalized offers. Nike uses QR codes in its stores to allow consumers to “Like” a product on Facebook, enabling consumers to share their affinity for a brand through recommendations on Facebook. A logical extension to this concept would be to provide rewards (loyalty points, mobile coupons, immediate discounts, etc.) for shoppers who provide such feedback. 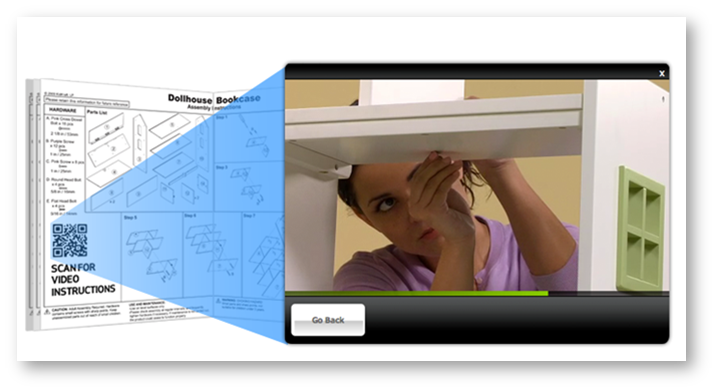 Ikea entertained the idea of using QR codes to provide video instructions on how to assemble products, such as furniture, making the post-purchase process a more enjoyable one. Similarly, QR codes can serve as an easy way to locate product manuals online or warranty information, which could be a real benefit to consumers who often do not keep such information that come with the products, and need to locate them immediately when something goes wrong. This would help cut down on support costs for retailers, in addition to fostering customer loyalty post-purchase. While 2D codes have reached a level of maturity where they are an effective tool for retailers today, they still have a number of challenges to overcome– standardization of code technology (open QR codes v proprietary MS Tags), reader availability, and deeper level consumer awareness beyond where it’s at today– optimally reaching the same level of consumer awareness that UPC barcodes enjoy today. They also face long-term obsolescence from Near Field Communication (NFC), but that is a ways off in the future given NFC nascent state at the present. Bottom line is that 2D codes do not require a lot of time or money to implement and can have large potential returns, so retailers should experiment with them while the cost of learning is low.